These words of Venerable Fulton Sheen echoed across the radio waves back in 1947 when he spoke about the effects of communism on modern womanhood and the decision our age must make whether or not it will accept the gift of woman, which produces the strongest societies, or reject that gift and live with the catastrophic consequences that come with that. Who can better reveal to the world the unique gift of womanhood that will make or break modern civilization than “the Woman” herself, who in her usual style of beauty and mystery left the world a timeless revelation at Tepeyac Hill on 12 December 1531, forever memorialized under her title “Our Lady of Guadalupe”. The global significance of Mary’s appearances in Guadalupe cannot be underscored enough. What took place in 1531, and the Marian revolution which followed for the next eight years, is a message for all the world! Let’s briefly look at the history of this event in order to appreciate its more important spiritual significance. It is a history contextualized between the seemingly endless conflict between Christianity and Islam and, more broadly, the culture of life versus a culture of death. Our reflection takes us back to the 8th century when the Moslems swept through Spain and the Christians there hid a highly revered statue, given to them from Pope St. Gregory the Great, of Mary who held the Christ Child. It was a statue referred to as the Divine Motherhood and to protect it from the Moslems, it was buried in the ground in the Extremadura mountains. When the Moslems were driven out six centuries later, the statue was miraculously recovered by a humble shepherd and later enshrined in a Franciscan monastery next to a river called “The Wolf River” (“Guada” = river, “lupe” = wolf) a name derived from Arabic during the Moslem occupation. So, the statue of the Divine Motherhood became known according to its Islamic name Our Lady of Guadalupe. This is an interesting fact considering Our Lady would do this again centuries later by becoming known as Our Lady of Fatima in 1917 – a name connected with Mohammed’s daughter. What our secular history books do not include about Christopher Columbus were the predominantly Catholic roots of his inspiration to discover what was later called “the new world.” Even less known is that the Franciscan monastery now located where the statue of Our Lady of Guadalupe (Spain) is currently enshrined was where both Columbus and Hernán Cortés came to pray before setting off to the Americas. 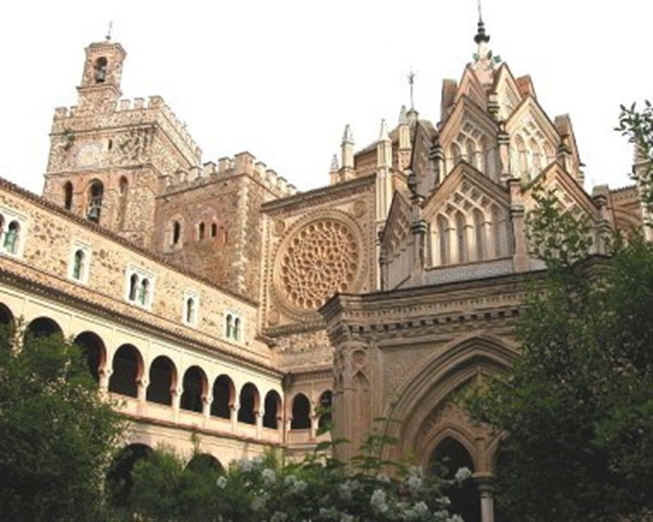 Fast forward to 1531 . . . the Church of the “Old World” in Europe is being torn to pieces by the Protestant Revolution and the impact of the early Franciscan evangelization into the New World is sparse as they encounter a diabolically inspired Aztec religion which was characterized by human sacrifice. From a Catholic point of view, things are a disaster on both fronts. You also have the growing threat of Islam returning to western Europe. Is heaven just passively watching the beginning of the end of Christendom? 9 December 1531 gave us the answer. Most are familiar with the story of St. Juan Diego and the visitations he experienced from a woman whom he learned was the Mother of Jesus Christ. I’d like to dial in on the deeper significance of the events and revelations. First, let’s reflect on the significance of the date. The visitations to St. Juan Diego began on December 9. Some may say, “Oh! just one day off from the Immaculate Conception date!” Well, historically, the first feast celebrated in honor of Mary’s conception was in the East and goes back perhaps as far as the 5th century in Syria . . . and it was celebrated on December 9. It was called “the Feast of the Conception of the Most Holy and All Pure Mother of God.” A few centuries later the feast was celebrated in the West on December 8. Is there any connection here that Our Lady was trying to make? Do Mary’s visitations beginning on this date even have any connection with her being the Immaculate Conception? This is where it really gets interesting, but because we have such limited space in a blog post, I will attempt to be brief in summarizing it. During Mary’s apparitions, she appeared to the uncle of St. Juan Diego, Juan Bernardino, and mediated a miraculous healing of a life-threatening illness. During her apparition to Juan Bernadino, Our Lady revealed that she wished to be known as “the ever-virgin Holy Mary of Guadalupe”. Catholic historians believe that Mary would have spoken this in the native Aztec language of Juan Bernardino, which would have communicated “Guadalupe” as coataxopeuh, which is pronounced “quatlasupe” (sounding very much like Guadalupe). This is indeed significant because the breakdown of the word coatlaxopeuh is the following: oa means “serpent”, tla means “the”, xopeuh means “to crush or stamp out.” Putting this all together, you have the name “Quatlasupe” meaning “the one who crushes the serpent” (and the Aztecs worshiped a serpent-god Quetzalcoatl). This allusion to Mary as “the woman” of Genesis 3:15 is remarkable as it is also used by the Church as one of the Scripture references supporting the dogma and feast of the Immaculate Conception. If that isn’t already awesome, we fast forward to the miracle celebrated today of St. Juan Diego’s tilma bearing the miraculous image of what one can say is Revelation 12 woven, literally, into the very fabric of civilization’s vestiture. There is the woman of Genesis 3:15 and Revelation 12 depicted [pregnant with Christ] in all her humility and glory at the same time: “And a great portent appeared in heaven, a woman clothed with the sun, with the moon under her feet, and on her head a crown of twelve stars; she was with child . . .” [Revelation 12:1-2]. And this “woman” who revealed herself as Our Lady of Guadalupe amidst one of the most violent cultures of death came as the Advent of Christ, pregnant with her Divine Son, ready to bear Him as the Mediatrix of Divine Mercy, to a civilization lost in darkness and death with the tenderness and power portrayed in that miraculous image. Historians report that within eight years, Our Lady of Guadalupe achieved the impossible — that approximately nine million Aztecs (basically a Pentecost a day for eight years) were converted to the Christian faith. Some even say that the number of Aztec conversions equalled those souls lost to the Protestant revolution. What Our Lady of Guadalupe accomplished in the heart of the Americas reveals that she indeed is the bridge-builder par excellence as she connected and expanded a fractured Church in the Old World with the budding Church in the New World (since Mexico was known as the “New Spain”). Mary appeared at the geographic center of all the Americas as the Immaculate Conception (compare Mary’s appearance on the tilma with how she is described by St. Bernadette in Lourdes when she said “I am the Immaculate Conception” — they are basically identical). 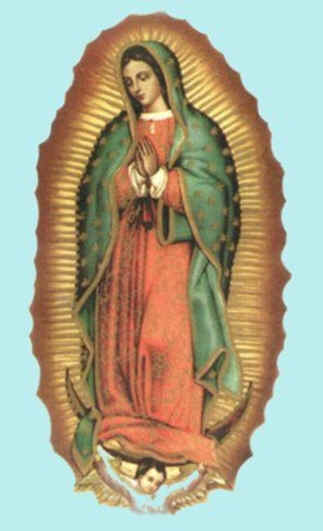 So, we have the Church of the East and West being united under Mary’s Immaculate Conception on 9 December, the Church of the Old World and the New World being united by the Blessed Mother bringing her Son to New Spain under the title “Our Lady of Guadalupe”, which also connects Mary with the Christian-Moslem problem. So, we’ve got North – South, East – West, Old World – New World, Christianity’s response to Paganism, Christianity’s response to Islam (In the battle of Lepanto, in 1571 Admiral Doria of the Holy League carried a small image of Our Lady of Guadalupe into the battle against the Moslems), Christianity’s response to the culture of death — all these represented in Our Lady of Guadalupe (aka Our Lady of the Divine Motherhood)! To what does Our Lady of Guadalupe not relate? 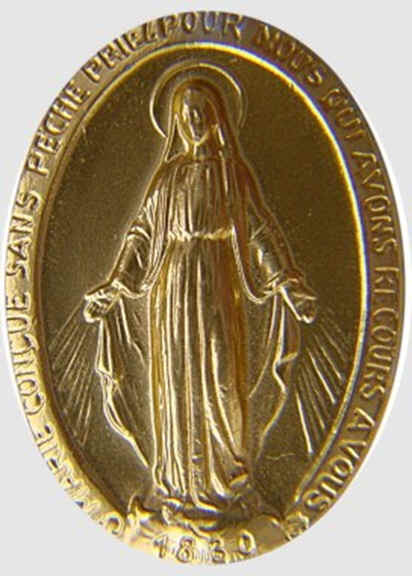 Now we begin to see why in 1999, at the dawn of the new millennium St. John Paul II pointed to Our Lady as the Patroness not only of the unborn, but as the patroness of the new evangelization . . . because she is the Advent of Christ in every way. Or, to put it another way, as Venerable Fulton Sheen did, she is the spiritual Trojan horse who gets Christ, hidden within her (as we see in the Tilma), behind the most fortified walls (beginning with the walls of our own soul). So, what does this all of this have to do with womanhood? Wherever Mary enters, she crushes the head of the serpent and recalibrates a disoriented society according to its worship, its womanhood and its “yes” to life! When womanhood rediscovers this is their genius, we will have a renaissance of culture the world has never seen! And we men better be the ones fighting for this! Our Lady of Guadalupe, Mediatrix of Mercy and Patroness of the New Evangelization, pray for us! Mary, Mother and Mediatrix of Mercy, pray for us!